Portland Retro Gaming Expo 2015 Token! Hollywood, CA October 15th, 2015 – DigThatBox.com is proud to announce a brand new collectible arcade token created exclusively for Portland Retro Gaming Expo 2015. The new collectible coin is minted in yellow brass with a brilliant golden luster. 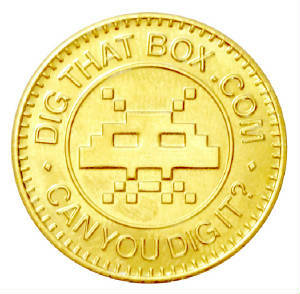 The front of the coin features the classic Pixel Invader, known as the logo and mascot of DigThatBox.com. 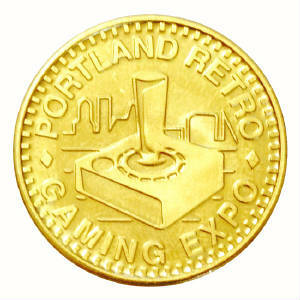 The back of the coin features a brand new design celebrating the Portland Retro Gaming Expo. The coin is limited to a run of just 1000 units. This is the twelfth coin in the DigThatBox.com arcade token collection. The coin was designed by site founder Elliott S. Thomas and Staff Artist Christian George Morehouse. The pair has collaborated on every token in the collectible coin series. The new collectible token will be made available on day one at the Portland Retro Gaming Expo. It will come in special PRGE 2015 themed packaging. Be sure to arrive at the show early as supplies will run out very quickly. If you cannot make it to the show, and have been collecting the previous tokens from DigThatBox.com, a new promotion will allow you to get one of these special coins in the mail. The site is launching a new “Collector’s Club” for people who have at least 5 or more of the previous coins in the series. Fans simply need to take a photo of their coins and send it to contact@digthatbox.com. Please be sure to include your name and mailing address. This club is limited to 100 members. Being a part of the club will guarantee that you receive all new tokens for the following year. DigThatbox.com would like to thank Rick Weis and everyone from the Portland Retro Gaming Expo for helping us make this unique promotion possible. The site would also like to sincerely thank everyone who has supported their Collectible Arcade Token series. This event would not be possible without the support of video game fans everywhere. Christian is an expert in the field of Movie and Television Props. He has also produced several amazing custom made toys that have been sold to dealers and collectors all around the Globe. His work is often imitated but never duplicated. His attention to detail and his commitment to perfection are unmatched. Retro Gaming Expo, Inc. is a Portland, Oregon-based 501(c)4 non-profit cooperative organization dedicated to creating awareness of, and appreciation for classic video and arcade games through the presentation of events and conventions that celebrate the historic contribution video games have made and continue to make in popular culture. The popular event seeks to educate the public about the importance of video game history, and to preserve this vital legacy. The show is organized by a volunteer board and a small army of volunteer staff that help bring the show to life. If you would like more information on this topic, or to schedule an appointment with a member of our staff, please contact us at contact@digthatbox.com.